The first weeks after our decision to separate, I walked around in a stunned, anxious limbo. I moved through the necessary parts of each day-getting kids to school, buying groceries, visiting the doctor, the lawyer, and the shrink. My body kept moving but I was barely cognizant of what street it was crossing. There was some sort of quiet explosion going on in my head that obliterated all other sights and sounds. One day during this weird foggy period, I found myself walking in the west 30’s, between the marriage counselor’s office and the number 3 train. I passed a small unassuming shop with featureless mannequins sporting hopelessly dated outfits. But something in the window called to me. Before I knew it, I was inside perusing all sorts of unlikely items made of… fur. The Russian women who worked there were all business- perhaps suspecting I was a PETA agent, they were reluctant to tell me much about their wares. With the briefest exchange of words, I sampled several items they told me were made of an “animal like rabbit but bred for their fur.” (This had to be what they call a Chinchilla rabbit, a bunny disguised as a rodent in name only). Having never before purchased a fur, I now lay eyes on something I felt I just had to have. Was it tasteful? Not hardly. Would I be wearing it daily? Not unless I planned to spend my evenings moonlighting as a streetwalker. It was, I’m sure you would agree a pretty hideous item. Don’t believe me? A surprising purchase for a middle aged mother of two who helps organize fairs for her block association. 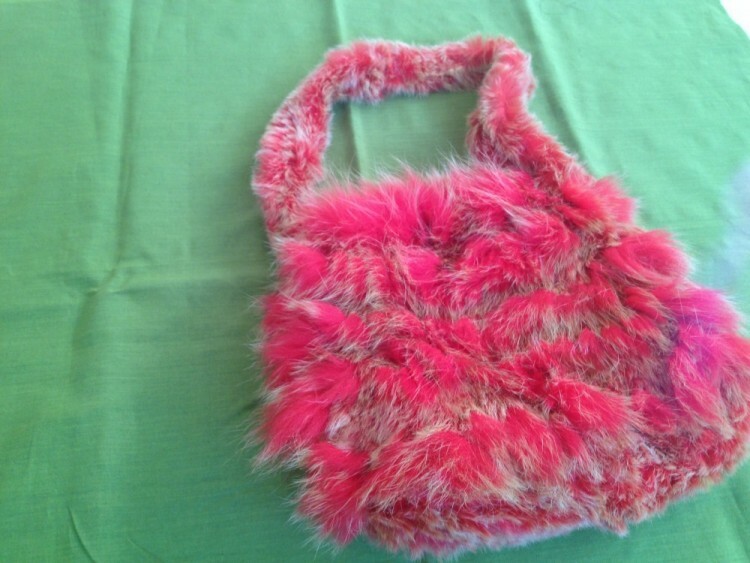 But for me this bag conjured the loud glamour of another decade. It took me to David Bowie’s London of the 70’s. Can you see it? With white patent leather boots and maybe a yellow polka dot raincoat over a silver lame dress? It also conjured up the person a few layers beneath the Brooklyn Heights Mom veneer. Some of the time, at least, she was a rebel. A hellion. A hussy. I brought my new bag home and just sort of held it for a while in front of the mirror in all its screaming orangeness. It reminded me of the night 17 years earlier that I wore the zany rocker platform shoes to a movie opening, drawing the notice of a Hollywood actress and leading to my falling for (and ultimately marrying) her date. It reminded me of the night 16 years before that, when I wore purple thrift shop stilettos to Studio 54, got a hug from Truman Capote and danced so long in my stocking feet that someone else eventually took my stilettos home. For days and weeks afterward, knowing I owned that bag gave me the sweetest feeling—an inner certainty that I was going to have fun again in my life. And I have. The hussy bag still hasn’t gone out with me yet. Sometimes, I will close my eyes and picture the woman wearing that bag. She is kind of me and kind of not. We are friends though. The hussy bag is still on my shelf, between quiet brown work bags and a sleek black clutch. Whenever I open my closet, there she is, that hellion, dancing up a storm.